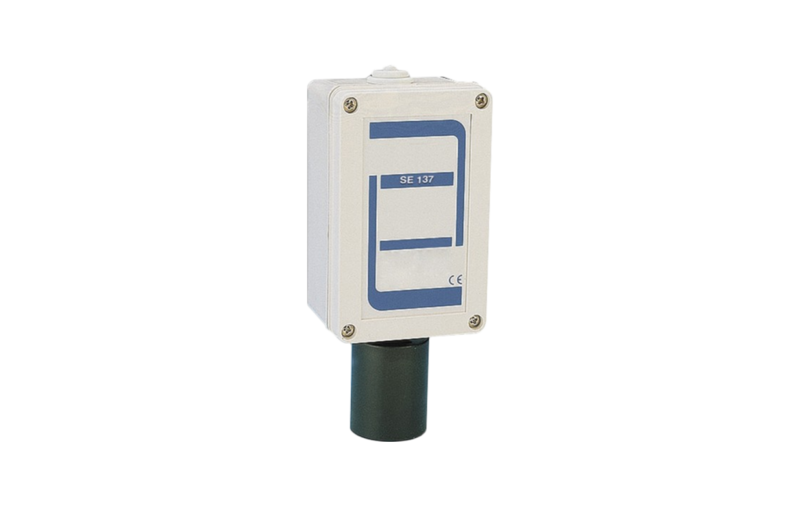 The SE137K is a flammable gas detector employing a catalytic sensor. The instrument comprises of a plastic enclosure housing the electronic circuit and the connecting terminals; the downward facing cylindrical section houses the sensor. This dual level gas detector has two alarm thresholds set to 10% and 20% LEL. The sealed relays are normally activated with tension free changeover contacts. Yellow LED « SENSOR FAULT »: faulty or disconnected sensor. Red LED « ALARM 1 »: 1st relay activation (10% LEL). Red LED « ALARM 2 »: 2nd relay activation (20% LEL). The SE 137K find their best application in centralized alarm systems for car parks, manufacturing industries, etc. OPERATIONAL DESCRIPTION Catalytic sensors are almost insensitive to humidity and temperature variations and are designed to detect various flammable gases. Even if the calibration is carried out for a specific gas, they can contemporaneously detect any other flammable gas that should be present in the same enviroment. Storage Temp. : -25 ÷ +55°C / 5÷95 % r.h.